Children with Down syndrome have unique health care and developmental concerns that often require integrated services from a multitude of health care, social, and educational services. The CHOC Children’s Down Syndrome Program is a community based clinic bridging community services and clinical specialists in Down syndrome to help ensure that these needs are being met. The clinic is not designed to replace the services of the primary care physician but rather to complement these services by providing supplementary medical care with an emphasis on preventive medicine and case management services. By collaborating with primary care physicians, Down syndrome specialists and community based support services we will help patients reach their potential and optimal health and development. Patients enrolled in managed care insurance plans will require authorization from the primary care physician. All necessary referral and authorization forms must be received before the patient’s visit. To make a referral or request an appointment, please call the CHOC Children’s Neuroscience Institute at 888-770-2462. CHOC Children’s Down Syndrome Program is an alliance with the Down Syndrome Association of Orange County. Learn more about the DSA of Orange County. Down syndrome is a genetic disorder that involves birth defects, intellectual disabilities and characteristic facial features. It also often involves heart defects, visual and hearing impairments, and other health problems. The severity of all of these problems varies greatly. Down syndrome is one of the most common genetic birth defects, affecting about one in 800 babies. In the United States, around 250,000 individuals have Down syndrome. Life expectancy among adults with Down syndrome is about 60 years, though average lifespan varies. The term Down syndrome comes from Dr. Langdon Down, the doctor who first described the collection of physical symptoms in 1866. It was not until 1959 that the cause of Down syndrome (the presence of an extra #21 chromosome) was identified. Most cases of Down syndrome are caused by trisomy 21. Occasionally, the extra chromosome #21 or a portion of it is attached to another chromosome in the egg or sperm; this may cause “translocation Down syndrome.” This is the only form of Down syndrome that may be inherited from a parent. Some parents have a rearrangement called a balanced translocation, in which the #21 chromosome is attached to another chromosome, but it does not affect their own health. Rarely, another form called “mosaic Down syndrome” may occur when an error in cell division happens after fertilization. These individuals have some cells with an extra chromosome #21 (47 chromosomes total), and other cells have the usual number (46 total). A child with Down syndrome may have eyes that slant upward and small ears that may fold over slightly at the top. The child’s mouth may be small, making the tongue appear large. The child’s nose also may be small, with a flattened nasal bridge. Some babies with Down syndrome have a short neck and small hands with short fingers. Rather than having three “creases” in the palm of the hand, a child with Down syndrome usually has one single crease that goes straight across the palm, and a second crease that curves down by the thumb. The child or adult with Down syndrome is often short and has unusual looseness of the joints. Most children with Down syndrome will have some, but not all, of these features. Children with Down syndrome are at increased risk for visual impairment. Common visual problems include crossed eyes, near- or farsightedness, and cataracts. Most visual problems can be improved with glasses, surgery or other treatments. A pediatric ophthalmologist should be consulted within the first year of life. This is a doctor who specializes in comprehensive eye care and provides examinations, diagnosis and treatment for a variety of eye disorders. Children with Down syndrome are at increased risk for thyroid problems and leukemia. They also tend to have many colds, as well as bronchitis and pneumonia. Children with Down syndrome should receive regular medical care, including childhood immunizations. 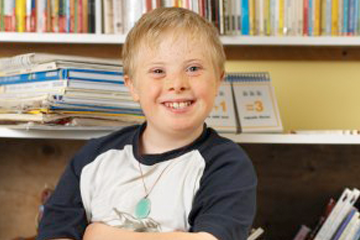 Children with Down syndrome can usually do most things that any young child can do, such as walking, talking, dressing and being toilet trained. However, they generally do these things later than other children. The exact age that these developmental milestones will be achieved cannot be predicted. However, early intervention programs, beginning in infancy, can help these children achieve their individual potential. Yes. There are special programs beginning in the preschool years to help children with Down syndrome develop skills as fully as possible. Along with benefiting from early intervention and special education, many children can be integrated into the regular classroom, to some extent. The outlook for children with Down syndrome is far brighter than it once was. Many will learn to read and write and participate in diverse childhood activities, both at school and in their neighborhoods. While special work programs are designed for adults with Down syndrome, many can hold regular jobs. Today, an increasing number of adults with Down syndrome live semi-independently in community group homes. They take care of themselves, participate in household chores, develop friendships, partake in leisure activities and work in their communities. What is the risk of having a child with Down syndrome? The mother’s age at delivery is the only factor found to be linked to the risk of having a baby with Down syndrome. This risk increases with every year, especially after the mother is 35 years old. However, because younger women are more likely to have babies than older women, most babies with Down syndrome are born to women younger than 35. The American College of Obstetricians and Gynecologists recommends that all pregnant women, regardless of age, be offered screening for Down syndrome. In general, for women who have had one child with Down syndrome, the chance of having another baby with Down syndrome depends on several factors, such as the mother’s age. It is important to know that most babies with Down syndrome are born to women under 35. This is because women under 35 have more babies than women over 35. Your physician may refer you to a geneticist or genetic counselor who can explain the results of chromosomal tests in detail, including what the recurrence risks may be in another pregnancy, and what tests are available to diagnose chromosome problems before a baby is born. It is important for new families to talk with their physician, other families and Down syndrome support agencies to learn what to expect with Down syndrome and to learn about things that may be helpful in raising a child with Down syndrome.